The Subito bore gauge for the measurement of cylindrical bores with a diameter from 4.5mm up to 800mm. The patented high precision deviation element, the segment is the core element developed by Schwenk over many years. The segment design ensures the contact pin travel is backlash-free which together the nickel alloy invar tube and precision assembly ensures excellent measurement and repeatability irrespective of hand and ambient temperature. High precision, measurement deviation of 0.002mm and repeatability of 0.0005mm. Large diameter centring plate to ensure high accuracy and repeatability. Can be used with all major brands of digital electronic or indicator dial gauges. Simple exchange of measuring pins allows easy adaption between a wide diameter-range. Features to allow blind-hole, grooves and recesses to be measured. 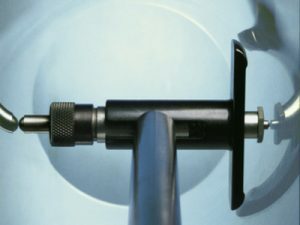 Feature to allow diameters to be measured in the mouth of the diameter being measured. Size range from 4.5mm to 800mm diameter and 3.0mm to 1,000mm deep. Subito SMT : for deep bores. Subito SS : for blind bores. Subito ST : for pillow block bores, grooves and recesses.